Last Thursday afternoon, one lucky AZ resident found a treasure in the AZ desert...a $3,000 certificate that was taped to the bottom of a rock near Hunt's Tomb, close to the Phoenix Zoo in Papago Park. What kind of nut would put $3,000 under a rock in the desert you ask? The Times Publications did, in an effort to increase readership of their Valley publications. 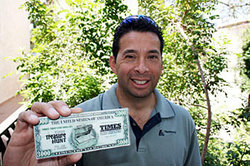 The Times Treasure Hunt began several weeks ago. The $3,000 certificate was hidden somewhere in the desert, and each Monday morning a new clue was released. It took nine clues before Ed Mujica found the certificate Thursday afternoon. I hadn't heard about the Times Treasure Hunt until a friend called me to see if I wanted to go 'digging for treasure' with her. Unfortunately, the treasure had just been found and it was too late. However, she had been out in the desert searching all week and said there were numerous other people out at Papago Park nonchalantly turning over rocks during their lunch hour. What a fun idea! If you missed the treasure hunt this year, no worries. The Times will likely do it again in another year or so!